Nothing demonstrates the fragility of life more than the unexpected loss of it. When lives are interrupted, the human capacity for sympathising with tragedy reaches across the ages as generations remember and retell the histories of those affected by sudden and devastating disasters. These events fracture families and communities changing them forever. The lives no longer lived continue to be sustained through the narratives of those who recount what a life stood for, who a person was, how they died. In a death is a lesson, is a purpose, and a place. A combination of elements that construct a history peppered with prosperity and hardship, spoils and irreversible misfortune, Queenstown in Tasmania’s west is one place that yields a tinderbox of excesses that make and break, leaving behind scars that are both symbolic of its future and of its past. With the work of Tasmanian painter Mandy Hunniford, the relationship between art and place becomes entwined as she negotiates the territory that is fundamentally historic on the greater factual plain, yet historic on the personal level that represent her sense of place and beginnings. 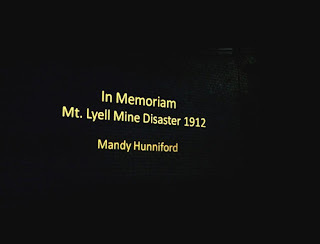 With memories of a childhood splashing in the tainted waters of Queenstown’s Queen River, Hunniford returns to her birthplace with a work about 42 miners who lost their lives in 1912 working to build the future community that the artist would come to know as a child. As part of the biennial Queenstown Heritage and Arts Festival that took place during the one hundred year anniversary on October 12 2012, Hunniford exhibited a work that not only visualised the naked Queenstown landscape, but framed it with chilling text. The work was dominated with the names, ages and places of birth of those men who died when fire broke out within the mine creating smoke that initially trapped, and then eventually entombed them one by one under cold, toxic, and tragic circumstances. 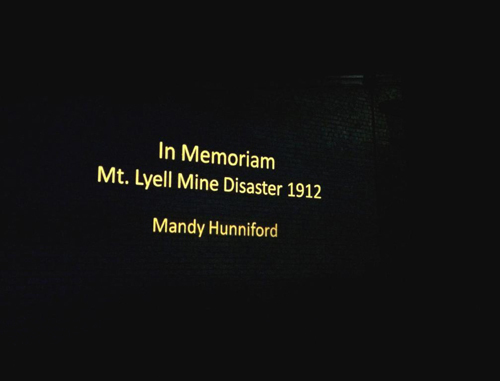 While In Memoriam – Mt.Lyell Mine Disaster 1912 was conceived and executed by Hunniford as an oil painting, closer inspection must be paid to the decision by the artist to project the painting rather than allow the audience to engage with the authenticity of its primary state during the festival. At the location of one of Queenstown’s most historic buildings, now known as the Galley Museum, Hunniford sought to overstep her career familiarity with the gallery space and embark into territory that provided a completely different aesthetic for her work both in scale and in light. The personal connection that she has to place, memory and childhood collocated with deep history and social context that continue to plague the region and its isolation in Tasmania, are evident in her rationale for doing something a painting can’t always do – embed itself in site down to the very grain of brickwork. 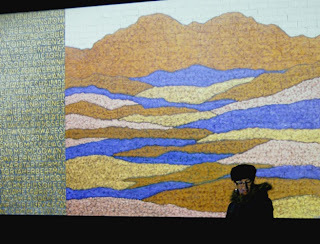 Through open-air night-sky projection, the artist’s distinct style of landscape representation is allowed to exceed its canvas and its visual limitations. It could be surmised that Hunniford chose to celebrate her own heritage while paying testament to those who died so tragically in 1912 by proceeding with a larger-than-life proposition. The painting, with striking hues of gold, grey, dusty browns and contrasting blues, was allowed to glow with an ethereal quality harking back to the fragility of the very lives the artist sought to chronicle. The landscape like a diorama providies the perception of depth that draws the viewer in. The bricks and mortar of the Galley Museum outbuilding on which it was exhibited, absorbed the original painting as if a ghost, intruded upon only by the darkness of night and the subtleties of town lighting. It is at this intersection where the past is superimposed on the present - the telling of history transcending the mortal boundary of those who perished through the profound process of remembrance. Through her painting Hunniford recognises value in history. Narrative has become a familiar staple in her work as she often combines imagery with text directly associated with the places depicted in her paintings. With In Memoriam however, there was a poignant sentiment of responsibility. Queenstown is Mandy Hunniford’s hometown and with that comes an allegiance experienced by many who grew up with memories of play, discovery, mischief and youthful exuberance, regardless of location. And with age comes the understanding of historical fact coupled with relatable compassion not fully appreciated in childhood. Men died, wives were left grieving, sons and daughters would never feel the warm hands of their fathers again, and a community would be left shattered. With that brief and desperate note to his wife, Joe McCarthy reaches out one last time then shivering in darkness breathing noxious air, he dies deep in the belly of the Mt. Lyell landscape. One can only imagine the thoughts in the mind of a man assured certain death once his pen is down and his goodbyes are written. All we have left is the words. In the case of Mandy Hunniford’s work, the desire and skill to contribute the historical dialogue is to re-imagine those words primarily through the act of painting, then reinvent that painting as an ephemeral testament in a time of commemoration through large-scale projection. On an otherwise, stark and functional wall, Hunniford temporarily tamed the darkness of the West Coast sky, paid her respects, and commanded attention to that fact that we are the custodians of stories and that a place isn’t somewhere we live. A place is something created through life and death and maintained by the intrinsic connections of the heart and history of those who pass through it.